When two runners converge upon one base, the situation may appear chaotic, but to an umpire well versed in the rules of baseball, such a comedy of errors is simply the product of an obscure rule book test question come to life. Knowing which player to declare out, and how to employ proper mechanics so as to avoid confusing or confounding the situation, is key to adjudicating this "Right of Return" play and looking confident while doing so. The Right of Return is a good rule to know. The Play: With one out and runners on first and second (R1 on first and R2 on second), Reds pitcher Austin Brice legally feigns to second before stepping off the mound and trapping lead baserunner R2 Trea Turner between second and third. As F1 Brice runs at R2 Turner, trailing baserunner R1 Brian Goodwin runs toward second base, stepping onto the bag and setting up a situation where both R1 Goodwin and R2 Turner will simultaneously stand on second base. F1 Brice initially tags R2 Turner before tagging R1 Goodwin to conclude the play. The Call: 2B Umpire James Hoye sees F1 Brice tag the lead runner, R2 Turner, and makes no call. When F1 Brice subsequently tags both R2 Turner and R1 Goodwin in quick succession, only then does 2B Umpire Hoye call R1 Goodwin out, decisively pointing to R1 Goodwin so as to confidently project which runner is out. In basketball, referees call this a "bird dog" (pointing toward the player who has committed the foul), and used to employ this signal on nearly every play. In the modern era, officials use the "bird dog" less often, similar to an umpire refraining from demonstration of a full wind-up "out" call on each and every play at first base. In short, this call is correct and the mechanics are superb. Hoye's mechanics help communicate the out. Who is Entitled to 2B? Neither Touching No No Either Runner. R1 Only Yes No Either Runner. R2 Only No Yes R2 Only. Both Touching Yes Yes R2 Only. 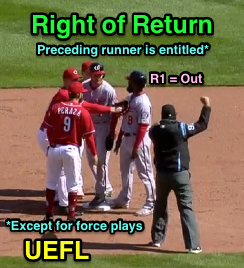 In other words, on non-force plays, preceding runner R2 is always entitled to his/her base of origin: in this situation, R2 can always go back to second base and if both runners are subsequently tagged while standing on second base, R2 is "safe" and R1 is "out." The only way trail runner R1 is entitled to the base to which (s)he is advancing is if the preceding runner R2 has already vacated that base; as soon as R2 returns to touch R2's original base, R2 becomes the entitled runner. OBR 5.06(a)(2) tells us everything we need to know: "Two runners may not occupy a base, but if, while the ball is alive, two runners are touching a base, the following runner shall be out when tagged and the preceding runner is entitled to the base, unless Rule 5.06(b)(2) applies." 5.06(b)(2) simply states that if the trail runner is forced to advance, then the trail is entitled to the base and the preceding/lead runner will be out when tagged; in a force play situation, the trail runner is always entitled to the base to the next base until the trail is retired; upon the trail runner being declared out, the preceding runner re-assumes entitlement to the base (see aforementioned "Situation: No Force" table). 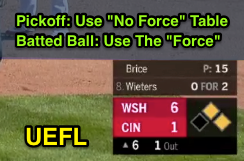 A batted ball force play is the only time you'd "use the force." Know the Situation, When to Use the "Force." Neither Touching No No R1 Only. R1 Only Yes No R1 Only. R2 Only No Yes R1 Only. Both Touching Yes Yes R1 Only. Sidebar: As stated above, if the trail runner (R1) passes the preceding runner (R2) before R2 is out, then R1 is out. However, as soon as R2 is out in a non-force situation, R1 is legally allowed to stand on the base. For example, if R2 was declared out (say, he was tagged off the base) and only then did F1 tag R1 (who was standing on the base), then R1 would be safe. If R1 arrives at and passes second base, and then tries to return to first when R2 retreats to second, he must retouch second base or be liable to be called out on appeal. Related Post: Solution for Case Play 2013-09: Whose Base is it Anyway? (9/21/13). 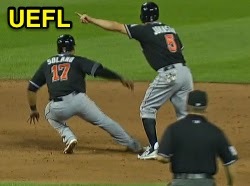 Sidebar of the Sidebar (Gil's Call): I just realized the above image showing the situation of two runners (R1, R2) and one out is also a potential infield fly. So in addition to using the "force" on a batted ball, remember that if the batted ball is an infield fly, the table you should use is the "not force" table, since the batter being declared out on the infield fly rule—which will occur before any potential play at second base—removes the force on R1/R2, meaning you shouldn't use the "force." Drawing even with a teammate is not "passing." Runners Passing Consideration: If R1's body entirely passes R2 (or if R1 passes a base that R2 is standing on), he is out immediately upon the passing. If R1 is simply touching R2 or even parallel to R2, he has not yet passed his teammate. Passing is an automatic out for time play purposes, and not an appeal play. Rule reference: 5.06(b)(9): "He passes a preceding runner before such runner is out." See the related post for more information about when a runner has passed a base, which carries a slightly different standard than determining when a runner has passed another runner.